It’s 1952 in Lapland, and Hella Mauzer has been sent to a little village on the Soviet border to investigate a crime her superior officer insists isn’t a crime at all. Erno Jokinen has vanished from his village, abandoning his small grandson. He could’ve wandered into the woods and gotten lost, then frozen in the cold or possibly been attacked by a bear, but the man was Skolt Sami, indigenous to the area and would know the forests well. The wife of the village priest has taken in the child and written to the police for help. Hella Mauzer refuses to brush aside her appeal. Hella is the first female polissyster on the Helsinki police force. Her actions have already brought her to her superiors’ attention, and she’s been told “if she doesn’t learn to rein in her temper, she would end up being thrown out of the police.” Nevertheless, she insists on going to Käärmela to investigate. It’s an arduous journey in winter, taking a timber truck to logging camp in the pine forest, then walking the rest of the way, and it’s complicated—getting approval for any expenses beforehand, checking the background of “involved parties” with the Security Intelligence Service. Also, the village is near the Soviet border and one has to be careful not to look as if one is trespassing on foreign soil. When Hella arrives, she finds everyone mostly hostile. There’s Jeremias Karppinen, in a suspicious hurry to have Erno declared dead so he can purchase his house, and Marta Jokinen, Erno’s aunt, who goes out of her way to be viscously unhelpful. The only one in anyway cooperating is Irja, the priest’s wife, and little Kalle, the grandson, who rarely speaks. When a body is discovered in the woods, Hella thinks the case is solved. It isn’t Erno’s corpse, however, but that of a woman. She’s apparently been mauled by an animal, only a few bones remaining. Someone remembers seeing the woman visiting Erno but no one knows her identity. Then Hella discovers a sketch Irja made of the unknown woman and Kalle, seeing it, gives the first clue. “You forgot the little stars she had on her shoulders,” he said accusingly. Erno was visited by a captain in the Soviet army. Kalle doesn’t remember the woman’s name or why she was there, just that she visited several times. Then she didn’t come any more and his grandfather went into the woods. From questioning the villagers, Hella comes to her own conclusions about the relationship between the female Soviet officer and Kalle’s grandfather, and it’s a very different one from what might be expected. There’s something going on in Käärmela. The villagers are in danger though they’re unaware. Only Hella has any inkling of what is happening, that a crime potentially worse than murder is being carried out in the little village. It’s a crime those in high places are aware of and will involves other countries including the United States. The average person probably knows nothing about Finland, other than it’s generally considered one of the Scandinavian countries, nothing of its participation during World War II or its position in the world order since that time. To the rest of the world, Finland is an anonymous country, a dot on a very large map. 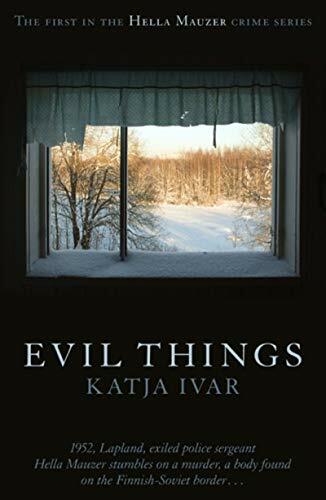 In Evil Things, that ignorance is immediately corrected with a short and concise history wedged between the events of Inspector Mauzer’s investigation, revealing Finland as a country where a great deal is going on. The country may be small and generally unknown but it houses some very interesting characters and its closeness to Russia makes it fatally strategic. Hella Mauzer is a woman in a highly visual position. The first woman hired by the Helsinki Homicide Unit, she’s under close scrutiny by her superiors but determined to do her duty and discover if a crime has been committed when others would simply ignore it. Evil Things introduces the readers to a small country where the winter snow hides a cataclysmic crime. It’s a chilling entry in this three-part series.